↑ "The Transitional Constitution of the Republic of South Sudan, 2011". Government of South Sudan. Retrieved 12 July 2011. Part One, 6(2). "English shall be the official working language in the Republic of South Sudan". ↑ "At a Glance". Official portal. Government of Southern Sudan. 12 July 2011. Retrieved 2011-07-24. ↑ "The Transitional Constitution of the Republic of South Sudan, 2011". Government of South Sudan. Retrieved 15 July 2011. Part One, 6(1). "All indigenous languages of South Sudan are national languages". ↑ "Discontent over Sudan census". News24.com. AFP. 21 May 2009. Retrieved 2011-07-14. 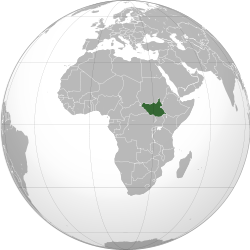 ↑ New country, new number: Country code 211 officially assigned to South Sudan. International Telecommunication Union. 14 July 2011. http://www.itu.int/net/pressoffice/press_releases/2011/25.aspx. Retrieved on 20 ਜੁਲਾਈ 2011. ↑ ".ss Domain Delegation Data". Internet Assigned Numbers Authority. ICANN. Retrieved 2011-09-01. ↑ 9.0 9.1 "South Sudan". The World Factbook. CIA. 11 July 2011. Retrieved 2011-07-14. ↑ "UN classification of world regions". UN. Retrieved 25 September 2011. ↑ "South Sudan profile". BBC. 5 July 2011. Retrieved 24 July 2011.